Arthur C. Clarke penned a work of near future fiction that ambitiously meets at the crossroads of science, religion, and human aspiration. Despite winning the two most prestigious awards in science fiction he felt the need to dip into familiar tropes with what feels like a tacked on ending. While not my favorite of Clarke's works it's still a great read from one of the masters. I’ve always been fond of the classics, both the books and the authors. As a fan of the genre I feel obligated to be knowledgeable about what has come before, and to be honest some older science fiction, while reading a bit dated from a technology viewpoint, are often superior in storytelling and vision when compared to their contemporary counterparts. As a bonus it’s much easier to find books of manageable size that aren’t part of a voluminous series. 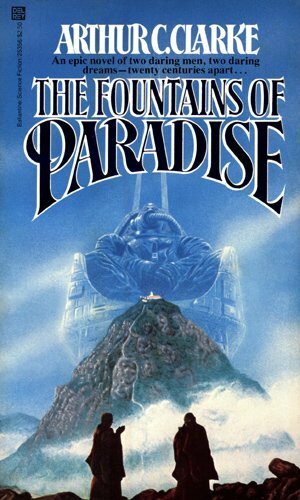 The Fountains of Paradise by Arthur C. Clarke isn’t THAT dated (1979), but it was published dead center in Clarke’s prime (about 1970-1985, at least by my estimation). In a seven year window during this period Clarke won two Hugo awards and two Nebula awards. The Fountains of Paradise accounts for half of those. I’ve had Fountains on my shelves since 1979 when it was published in paperback. It followed me through high school, college, marriage, career, and now on the skids towards retirement. I’m slowly working through all the Hugo and Nebular winners and needed a book. I grabbed it off the shelf thinking it was finally time to jump in. Granted, I read Fountains four years ago so, as usual, I’m behind in my reviews . . . but it’s never too late to catch up. At its heart The Fountains of Paradise is an ambitious tale dealing with the intersection of technology, religion, and fictionalized history. Vannevar Morgan is a prominent engineer who has the vision of developing the first space elevator, a marvel of engineering that would allow the transport of people and goods into Earth orbit. The only feasible location on Earth to place the bottom of the elevator is the summit of a mountain (Sri Kanda) in Sri Lanka that happens to be the home of an ancient monastery which is the home of Buddhist monks. Underlying the near future plot line is a fictionalize historical account of the life and death of King Kalidasa set 2000 years earlier. Yakkagala was the home of Kalidasa’s opulent palace, in which he thought himself a deity and constructed lush gardens with a series of fountains technologically centuries ahead of their time. Vannevar Morgan’s visionary dream would link Earth to the stars — if a million technical problems could be solved — if rival nations could be persuaded to cooperate — if the money could be found — and if the ages-old order of monks atop Sri Kanda would allow their sanctuary to be profaned forever by a 22,000-mile-high space elevator . . . The story of Vannevar Morgan is Clarke’s modern interpretation of Kalidasa’s fictionalized feats of engineering (based loosely on the real King Kashyapa I). The real fountains, on which the title is based, are still functional today, 1500 years after they were built. Both are engineers born well before their times, both challenge preconceived notions of human limitation, and both meet untimely ends. Clarke manages to juggle this juxtaposition of time frame and themes with his usual aplomb and brevity. The amazing thing is he manages to do all of this in just 300 pages, and this is exactly why I love reading classic science fiction. One perplexing aspect of The Fountains of Paradise still sticks with me. The ending. Clarke revisits his common tropes of advanced aliens entering our solar system and giving us an unasked for nudge, or knock on the front door (Childhood’s End, Rendezvous With Rama, 2001: A Space Odyssey). Is it even needed? Did he need to touch on the Starholmer’s visiting Earth in the far future? It hinted at a future that could lead to another very interesting book, but Clarke never did leverage the ending in to another tale. Regardless, the whole Starglider/Starholmer ending seemed tacked on and completely unnecessary when viewed in perspective of the larger tale being told. Despite the ending The Fountains of Paradise is still a book that all connoisseurs of classic science fiction should pick up and read. Arthur C. Clarke penned a work of near future fiction that ambitiously meets at the crossroads of science, religion, and human aspiration. Despite winning the two most prestigious awards in science fiction he felt the need to dip into familiar tropes with what feels like a tacked on ending. While not my favorite of Clarke’s works (That would be 2001 and The Songs of Distant Earth) it’s still a great read from one of the masters.